Saturday at the Spruce Meadows ‘Masters’ Tournament is always full of excitement with fans cheering on their favourite teams in the BMO Nations Cup. This year nine teams competed for glory and to have their names put on the trophy that has been a part of the Spruce Meadows Collection for a very long time. Athletes were challenged over 12 obstacles with a time allowed of 74 seconds. In round one a limited amount of clear rounds were posted, but Germany made it look easy finishing in first after round one on a team score of zero. Defending champions, the United States, finished round one on a team score of 8, followed closely by the Irish and Canadians with team scores of 10 and 12, respectively. After two rounds of competition, Germany remained at the top of the leaderboard, finishing on a team score of 6. It was a battle for second place between Team Canada and Team Ireland – clear rounds were crucial. Two clear rounds for Canada posted by Kara Chad and Eric Lamaze had the crowd on their feet, as it would secure a silver medal finish, forcing Ireland to take the bronze. 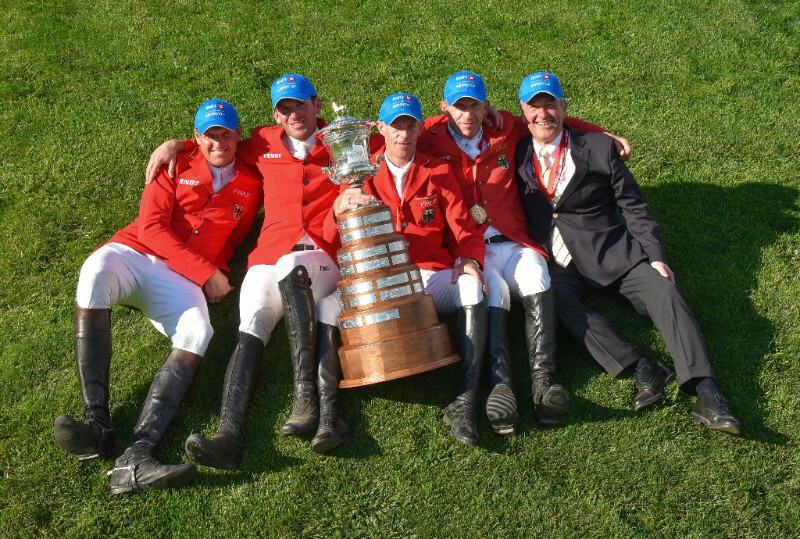 “It is the greatest Nations Cup in the world – it’s unbelievable!” – German Chef d’Equipe Peter Hofmann (GER) on winning the BMO Nations Cup. Earlier in the week riders competed to earn their spot in the Suncor Winning Round (1.50m). Only 30 horse/rider combinations qualified for the event and of those athletes, the top 10 from Round One, moved on to compete in the Winning Round. There were 10 clear rounds posted in Round One, and all proceeded to the Winning Round. The rider with the best score in Round One would have the opportunity to go last in the Winning Round and Dutch rider Maikel van der Vleuten held that position with a quick clear time of 70.77s. It was an even playing field going into the Winning Round, with all riders starting on a zero score. Conor Swail (IRL) was first to go and posted a quick clear time of 54.38s in the Winning Round but that was short lived as Philipp Weishaupt (GER) flew around the course in a time of 53.25s. Van der Vleuten had the advantage of being able to watch the 9 competitors before him, but could not catch Weishaupt’s time and it would be a victory for Germany. “It feels amazing to win” – Philipp Weishaupt (GER) on starting the weekend with a win.